CHIEF JUSTICE STEELE'S REMARKS AT A NATIONAL CONFERENCE: "FIRST STATE FIRST RATE"
Chief Justice Steele, United States Supreme Court Chief Justice John Roberts, and Chief Justice Steele’s law clerks, Vincent Thomas and Patrick Karsnitz, after Chief Justice Steele’s remarks at the U.S. Chamber of Commerce conference. What makes the First State First Rate: A view from the Delaware Supreme Court was the topic of a speech given by Chief Justice Myron T. Steele, the featured speaker at a conference held by the U.S. Chamber of Commerce’s Institute for Legal Reform and the National Chamber Foundation in Washington, D.C. on July 18, 2006. 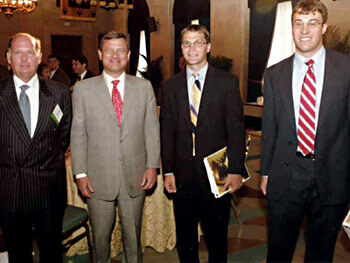 Distinguished attendees included United States Supreme Court Chief Justice John Roberts. In his speech, Chief Justice Steele identified several factors that work to make Delaware’s court system first rate. Foremost among these, he indicated, is the exceptional quality of its judges. This is the result not only of having a sophisticated legal community from which to draw, but also the result of a selection process which is merit based and as politically neutral as possible. In addition, he noted, there is a concerted effort to attract and retain high quality judges by providing rational compensation and opportunities for professional growth through statewide collegiality, as well as outside continuing legal education and interaction with peers on a national basis. Chief Justice Steele also stressed that the Delaware courts think of themselves as businesses that need to provide quality service to their customers. Finally, the Chief Justice pointed to the strong relationship the Judicial Branch has built with the other branches of state government and the ensuing commitment of the General Assembly and the Governor to providing the necessary resources to maintain the excellence of the Delaware Judicial Branch, including keeping it at the forefront in technology. The one-day conference was designed to examine the current condition of the judiciary in the United States. Delaware courts were viewed as a role model, as the Institute for Legal Reform has long recognized the success of the Delaware courts, having ranked the Delaware courts first in the nation for the fifth year in a row.